Welcome to the latest installment of Jack & Mimi’s Cheap Date. Here are the rules: Each week, my girlfriend Mimi and I go somewhere in the Tacoma area for a cheap date where we spend $20 or less. This does not include tips because service is unique and can’t be universally quantified. This week we take a look at Vien Dong. I’ve spent most of my adult life living in Tacoma’s Stadium District and the North End, but I grew up on Tacoma’s South Side on South 40th & Fawcett. A few blocks away on South 38th Street is an area my parents called ‘little Vietnam’ due to the amount of Vietnamese businesses there. In 1989 Vien Dong opened its doors on the corner of South 38th & Yakima Ave. and quickly became a fixture of the neighborhood. We parked on the street and walked into a fairly empty restaurant on a Monday afternoon. There was one couple at a table and an old woman at a table by herself. We chose a seat and were given menus and hot tea with two small cups. Mimi had never been there before and it’d been long enough that I didn’t remember what their prices were like. So I was surprised when I found that there were plenty of options to keep us within our $20 budget. Given the variety of choices, it took a while for us to decide. Ultimately I chose number 32 Com Chien Duong Chau – Fried Rice with your choice of Shrimp, BBQ Pork, Chicken, or Beef. (I chose beef.) 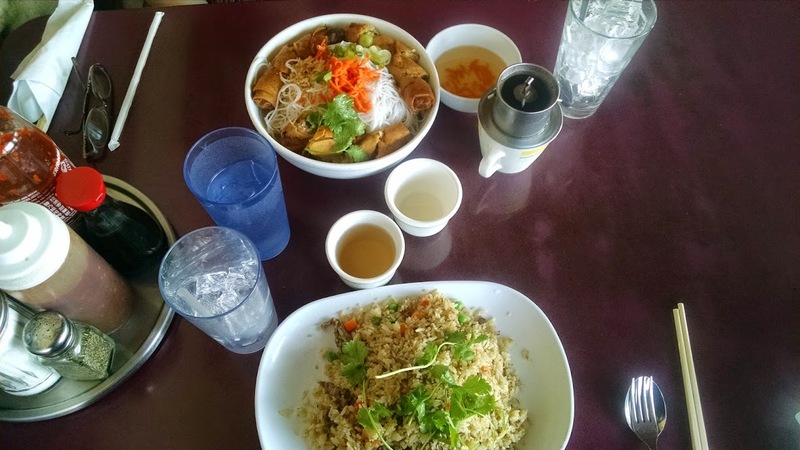 Mimi chose number 22 Bun Cha Gio Tren Khay – Egg Rolls & Vegetables Served in a bowl. Mimi also ordered a Café Sua Da – Iced French Coffee With Condensed Milk. I stuck with tea and water for a beverage. The food arrived very quickly. The first thing I noticed was that our portions were huge. I took a photo of the table and realized I had to stand up to fit it all in the picture. Mimi enjoyed her food and found it incredibly filling. In fact, she wasn’t able to finish it all. My fried rice was a tiny bit too fried, but still enjoyable. When it came time to leave, we wandered over to the cash register. 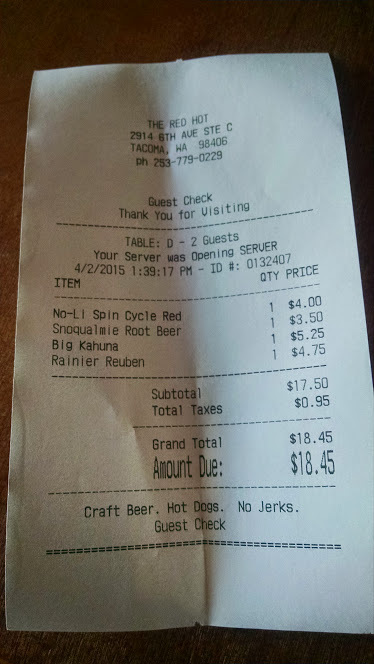 Despite seeing the prices on the menu, I was still surprised when it only came to $17.25. This was easily the most food we’ve had so far on our Cheap Date excursions and one that we’ll definitely return to another time. 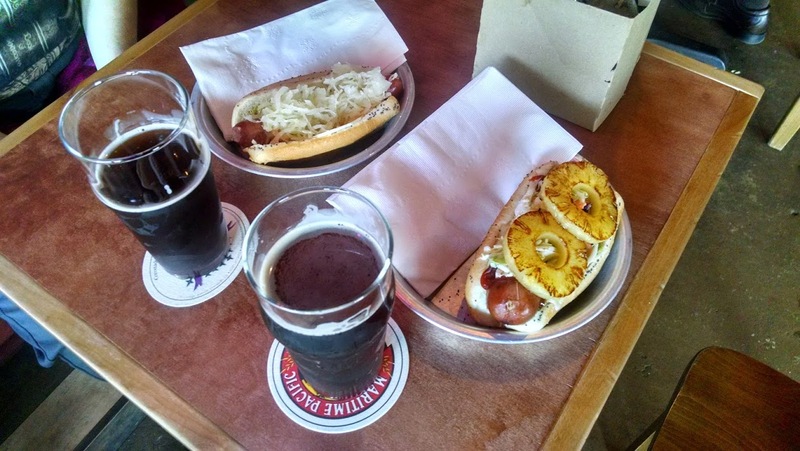 The South Side has many worthwhile places to discover. After our meal we went across the street to a wonderful shop full of random things and purchased a couple of noodle bowls. Where should Mimi and I go next? If you’ve got an idea, let us know. Email me at jackcameronis@gmail.com. In the early morning hours of Thursday April 16th, two or three men arrived at the apartment of Larnell Griffin on South 40th and S. Lawrence Street. One of them had a dispute with Larnell over a cellphone. According to a witness Larnell put his hands up and backed up. When his attacker did not lower the weapon, Larnell struggled to disarm him and was shot. Police arrived at 1:45am to reports of shots fired. Larnell was taken to Madigan Hospital where he died. 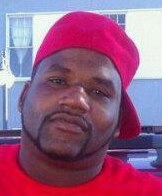 The murder of Larnell Griffin is only the second homicide in the city of Tacoma this year. And yet, despite the lack of lethal violence in Tacoma lately and an active manhunt, local media have all but ignored this killing. I found exactly one article on komonews.com with no mention of Larnell’s attacker and no articles at king5.com or kirotv.com. Our local paper, The News Tribune, Crime Stoppers, and this site are the extent of the media coverage in the death of 33-year-old Larnell Griffin. Of course this is nothing new. All major local television is based out of Seattle and in Seattle, Tacoma is often still regarded as a place where these sort of shootings happen every day. Thankfully the crime rate in Tacoma has continued to go down. However, no matter how low the crime rate might get, those who are friends and family of its victims are still devastated by their loss. No lack of coverage by the news can minimize what’s happened. According to Larnell’s Facebook page he was married. Photos show a young child. Whenever a life is lost, countless lives are changed. As always, the comments section is reserved for friends and family of the victim. Those who knew Larnell are encouraged to share their thoughts and memories. Each comment is approved by me to keep negative comments to a minimum. To the friends and family of Larnell, I’m sorry for your loss. Here’s hoping his killer is apprehended and brought to justice quickly. Update: The person police believe is responsible for the murder of Larnell was arrested on the evening of 04/21. If you spend much time on Tacoma’s 6th Ave. you’ve probably seen her work. 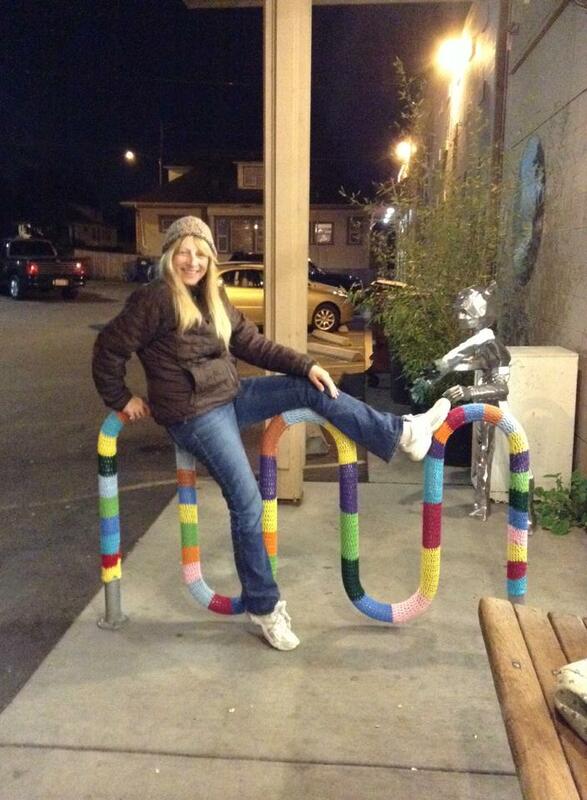 If you’re lucky you may have even seen her in the process of covering a bike rack with yarn. Often the yarn will be colored in themes that reflect nearby businesses. For a while, I had no idea who was doing it or why. Recently I got in touch with the self-described 6th Ave. Yarn Bomber and she agreed to participate in this week’s 5 Question Friday. 1. How did you start being the Sixth Avenue Yarn Bomber? I started yarn bombing about a year and a half ago after not such stellar sales at Art on the Ave where I was selling my Original Growler Sweaters. I noticed that people we’re draw to the yarn the bright colors really attracted them. However many had no clue what a growler was. It was after that I decided to take it to the street. I had no idea how I was going to do it until I saw the bike racks. It just struck me, they would look awesome covered in yarn. So it began my yarn awareness. Why sixth ave, because its my home. I have lived on 6th Ave (or just a block or two off) for the past 25 years. Also in my teenage years I went to Stadium and we regularly hung out on 6th ave. I just love this neighborhood and want to do my part to help make it as awesome as it can be. I recently had to move from my home of ten years on 6th and Fife but quickly found a new place just two blocks off sixth Ave. I feel very fortunate to have found a place so close to the Ave so I will be able to continue my bombings. 3. Where is the one place you’d like to yarn bomb that you haven’t? I have one place on 6th Ave I have planned on bombing for over a year. I just haven’t gotten around to it yet. But I will. 4. What can those who want to support your yarn bombing do to help? I welcome any donations yarn or money. This year has been a real struggle. I am now single and fully supporting my self working a full time and part time job, I also sell hats and growler sweaters. I have a lot of bombs out there and plan more. They also need to be replaced on a regular basis and the costs add up. So I am extremely happy for any donations big or small, they all help keep it going. I have started a go fund me for anyone wishing to help out. 5. What’s next for the Sixth Ave Yarn Bomber? Currently I am one of the artists featured in episode 4 of TV Tacoma ‘ s show “Art Town” (now airing) for the future, I am presently working on getting a project for kids together for Maritime fest coming up this summer, I also have plans for some new installations for Art on the Ave and am continuing to replace wore pieces. I also want to hit up some other Tacoma neighborhoods too. The Sixth Ave. Yarn Bomber’s work can be seen all over 6th Ave. You can donate to her yarn bombing fund at this link: http://bit.ly/1OOxf1J I’d like to thank her for taking the time to join me on 5 Question Friday. If you or someone you know would like to participate in 5 Question Friday drop me a line at jackcameronis@gmail.com. Welcome to the latest installment of Jack & Mimi’s Cheap Date. Here are the rules: Each week, my girlfriend Mimi and I go somewhere in the Tacoma area for a cheap date where we spend $20 or less. This does not include tips because service is unique and can’t be universally quantified. This week we take a look at The Rosewood Café. The Rosewood Café is a quiet little place on the corner of North 26th and Warner near the Proctor District. 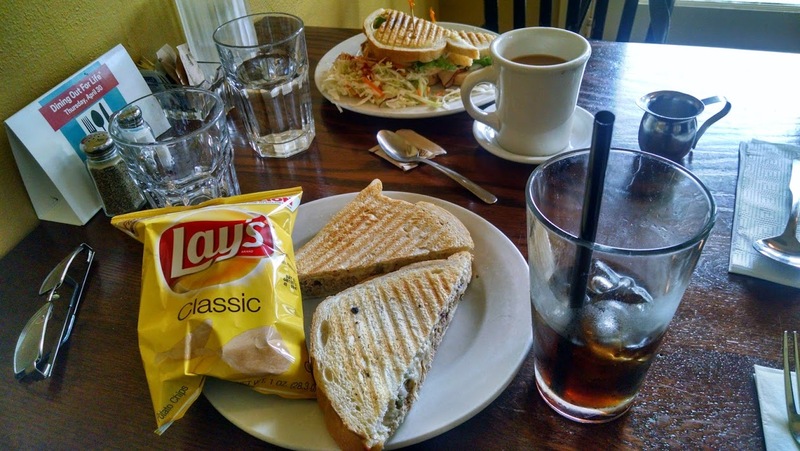 They’re primarily a sandwich shop with a relaxed style that’s both comfortable and familiar. It feels nothing like a franchise. One day last week, Mimi and I stopped by for a cheap lunch date. The Proctor area is notorious for being expensive. The Safeway a few blocks away recently tried to start charging for parking in their lot, but public outcry stopped them. Simply put, the Rosewood isn’t the first place I’d think to go if I only wanted to spend twenty dollars or less. Mimi and I looked over the menu. She decided on the Rosewood Deluxe. The menu describes the Rosewood Deluxe as “Oven roasted all natural turkey, smoked bacon, Havarti cheese, fresh lettuce, tomato, and red onion. Served on grilled peasant bread with mayo.” It was $8.00. I chose the Big Tuna Melt for $7.50. We each got beverages. I got a Coke. Mimi got a decaf coffee. The food arrived fairly quickly. My tuna melt was warm and delicious. It was good sized, but I’m not sure it earned the title ‘Big’. The Coke was from a can, but though I had two, they only charged me for one. Mimi said that her Rosewood Deluxe was alright. She enjoyed the coleslaw side and felt that the fact that the sandwich was toasted really improved the sandwich. Between the atmosphere and the sandwiches, our cheap date at the Rosewood was very enjoyable. Unfortunately, there was a problem when it came to the bill. Our sandwiches came to $15.50. Our beverages were each $2.25. 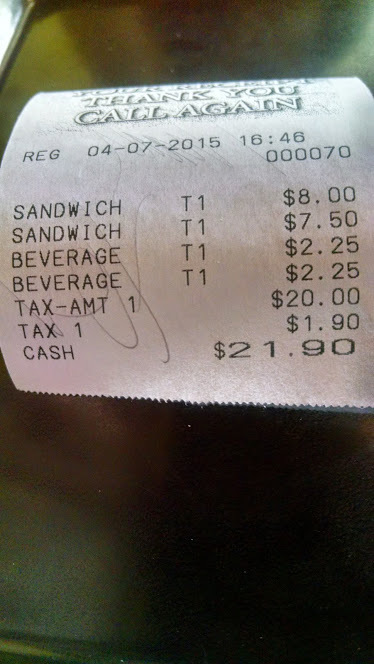 Our total before tax was exactly $20.00. Jack & Mimi’s Cheap Date failed to come in under our twenty dollar limit. So while I recommend people check out The Rosewood Café for good food and a quiet local atmosphere, I can’t recommend it for a Cheap Date.